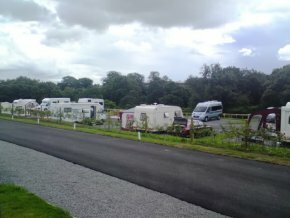 We stayed at the Caravan Club’s new Teesdale Barnard Castle site during its first week of opening. The site was very easy to find as the directions were given on the CC website (I was going to update my Sat Nav POI but I did not have the time). The directions advise you to take the second road that is sign posted to Barnard Castle and ignore the first which would take you through the town. I think this is fair and reasonable as Barnard Castle does get busy and there are places where the road narrows to such an extent that you would have to stop to give way to oncoming traffic. Teesdale Barnard Castle CC during it’s first week of opening. We were greeted by the usual cheery (but tired!) wardens who had to apologise for the playground being closed due to the fact that it had not been finished by the contractors. We made our way to our ‘open plan’ and serviced pitch along a perfect tarmac road and we reversed on without making contact with the grass verge (which with our outfit is good going and shows the width of the road has been well thought out). Sadly, the water supply was not well thought out, as it was nowhere near where I would have expected it to be. In fact, it was about 20 metres away and I had to borrow a connecting hose from the warden (thanks Paul) as my 7.5m Aquaroll Mains Kit One was woefully short. I am not sure who designed it this way but you screwed up! In essence, this meant that every other unit along the row would be affected in the same way we were. We did not bother with the awning, due to the fact that the weather forecast was sunshine and showers for all three days. There was however, plenty of room. The only thing that looked unsightly was the turf, as quite a bit of it had not taken and died. 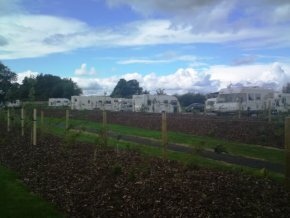 The site is on two levels, so you can see the roofs of the lower caravans. 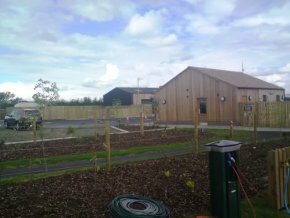 Other than that, the site facilities are up to the usual high CC standards. The information room has lots of leaflets about places to visit and I placed a few more in there from the local restaurants and takeaways following a trip into town. Location wise, the site is adjacent to a B road which, whilst not exactly busy, the fact that it is a ‘national speed limit’ road means there is some road noise (not that anything wakes me up!). There is also a risk of visitors in the night nicking your equipment as the entry/ egress is so easy. The site does have double wooden gates but these are not closed, as doing this would mean obstructing the road whilst opening and closing them (poor design again). Another example of poor design was that the exit barrier also has a proximity reader which caused the traffic to back up on Sunday when people were leaving (as the exit was blocked beyond the barrier) whilst they ran to the office to return the fob. The turf was a bit unsightly, but the rest of the site was up to the CCs usual high standards. Barnard Castle itself is a nice market town with plenty of on and off street parking. The site information only mentions a Co-operative store, but behind it there is a Morrisons, which shows poor local research by the CC. There was a great but small farmers’ market on the Saturday and the town also has a few traditional butchers. There are the usual banks, a Boots, Superdrug, Costa Coffee and a good assortment of pubs, restaurants and takeaways. There is also a very good ‘tardis-like’ hardware store adjacent to Morrisons but the car park here is pay and display (it is not expensive though). We will visit again as there is lots to see and do here and the countryside is spectacular. I will take my mountain bike next time if the forecast is better. Header banner image credit to Francis Hannaway [CC BY-SA 3.0 (https://creativecommons.org/licenses/by-sa/3.0)], from Wikimedia Commons.